The first day of summer vacation stretched in front of Natalie Wallis like a long road with no street signs. It was only ten in the morning and already she missed school. Already, she longed for homework and teachers and tests. Already, summer was boring. So she gave herself an assignment. See how fast you can ride your bike around the block. Natalie wrote this in extra-neat cursive in a notebook left over from school. She set the notebook in her straw bike basket and zeroed out the stopwatch hanging from her neck. Then she strapped on her helmet and mounted her pink bicycle. Over and over she rode around the block, passing the same anthills and dried worms and blackened gum dots on the sidewalk. Each time she circled, Natalie refined her course a little more. She learned to avoid the familiar cracks and pits in the concrete. She stopped waving hello to the neighbors as she passed their yards, giving them quick, aerodynamic nods instead. After half an hour, her record was two minutes and twenty seconds. Not good enough, Natalie thought. I can beat that. She took off again. Her long brown braids swung with each pedal push, her glasses fogged with sweat, and the sidewalk became a gray blur beneath her. The route was so familiar by now, she was able to round each corner at the perfect angle and speed. Natalie turned the last corner and came to the homestretch, the steep hill that led up to her house. Just a little way to go, she coached herself. Natalie looked up. Not ten feet ahead, a small, skinny boy stood with his palm shoved out like a traffic cop. She screeched on her brakes to avoid hitting him, her front wheel wobbling to a stop dangerously close to the boy’s knees. He didn’t flinch. Natalie forgot all about checking her time on the stopwatch. She forgot about the plot of the wolf book. She forgot everything but this boy who had appeared out of nowhere. She flicked her kick-stand down. She recognized the boy. He and his dad had moved into the gray house kitty-corner from hers about a month ago. As Natalie left for her private-school bus stop, she would watch him stomp to the public-school bus stop at the other end of the block, whacking his backpack on the fence posts as he went. Some of the kids at Natalie’s stop would laugh at him. “What a freak,” they’d say. Once the boy got to the corner, he’d throw pebbles at the stop sign. Natalie would listen to the distant metallic pings until his bus came, or hers did. The boy wasn’t wearing a shirt today. From up close, Natalie noticed that his skin was so pale you could see the blue veins underneath, and his chest was covered with scabby mosquito bites. His short, spiky hair was so blond it was almost white. He was still holding his hand out, willing Natalie to stay where she was. The other hand was behind his back. “I’m gonna tell you a secret,” he said. “Boy?! I’m not a boy. I’m a GIRL!” The shout echoed off the houses. “Oh,” Natalie said again. True, it was hot. But would Natalie ever walk around without a shirt? No. Never. Not even if it was so hot, the grass melted. Not even if the hose water came out boiling. Natalie scanned Annie’s face for clues of her age. Her teeth were coming in large and crooked, like Natalie’s. But she still had some baby fat in her cheeks. She’s maybe a year younger than me, Natalie guessed. Yeah, probably nine. “What grade are you in?” Natalie asked. Annie came to the side of the bike and cupped a sweaty hand to Natalie’s ear. Her breath smelled like cheese puffs. Annie brought her other hand from behind her back, her fingers closed in a careful fist. Her finger-nails were bitten down to nubs and outlined in black grime. She slowly opened her hand to reveal a tiny, pale bird. It had a bald, pink head and dark blue eyeballs that showed through its transparent eyelids. After a few seconds, the bird hadn’t moved. Natalie touched one of the naked wings with a nervous finger. “Ew!” Natalie cried, jerking her finger away. “You’re sick.” She gripped her handlebars and snapped up the kickstand. “What, a dog that got hit by a car? No thanks.” Natalie rolled her wheel onto the boulevard and pedaled over the thick grass. Before she could ride off, Annie snatched the spiral notebook from the bike basket. “Hey!” Natalie screeched. “Give that back!” She made a wild grab for the notebook and almost fell off her bike. Annie backed away. She began flipping through the pages. “Wow, you have nice handwriting,” she said. “Give it back right now,” Natalie demanded. She dropped her bike on the grass and charged, but Annie darted out of her grasp. “I’ll give it back if you come see a secret under my porch,” Annie said. “No way.” Natalie grabbed at the notebook again, and Annie whisked it out of reach. Despite being so skinny and frail-looking, she was quick. “Then say good-bye to your book,” Annie said, skipping off the curb. She paused in the middle of the street to do a little waltz with the notebook, the front and back covers held out like arms of a dance partner. As she whirled onto the opposite boulevard, she shot Natalie a toothy grin. Natalie sighed and dropped her chin to her chest, knowing she’d have to follow. As she looked down, she saw that the stopwatch around her neck was still counting. She pressed the stop button. Five minutes, forty seconds. For turning a calm summer day completely upside down, it was a new record. 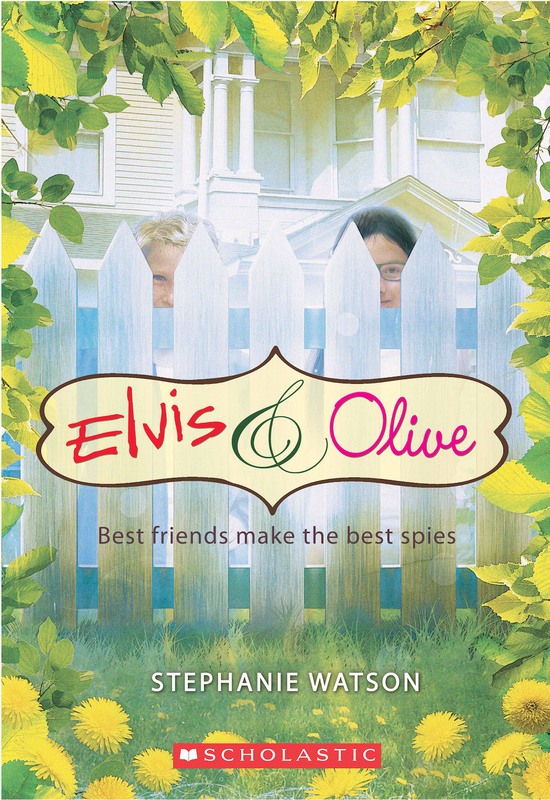 Excerpted from ELVIS & OLIVE © Copyright 2008 by Stephanie Watson. Reprinted with permission by Scholastic Press. All rights reserved.